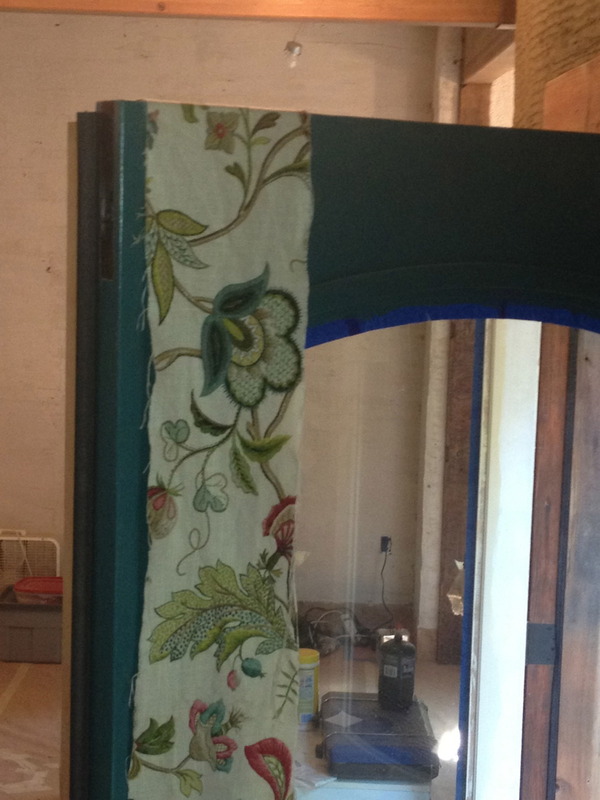 These are the reclaimed doors we got from a cool vintage salvage place that our friends, Paul and Becky, own in Astoria, Oregon. The fabric was found by my dear friend, Stacey. I begged her to bring a scrap of fabric with her on her trip to Italy in search of an Italian version of my JoAnn's scrap. No luck in Italy, but she found THIS (even better option) at a local fabric store, and I am builidng the color palette around it on the first floor. 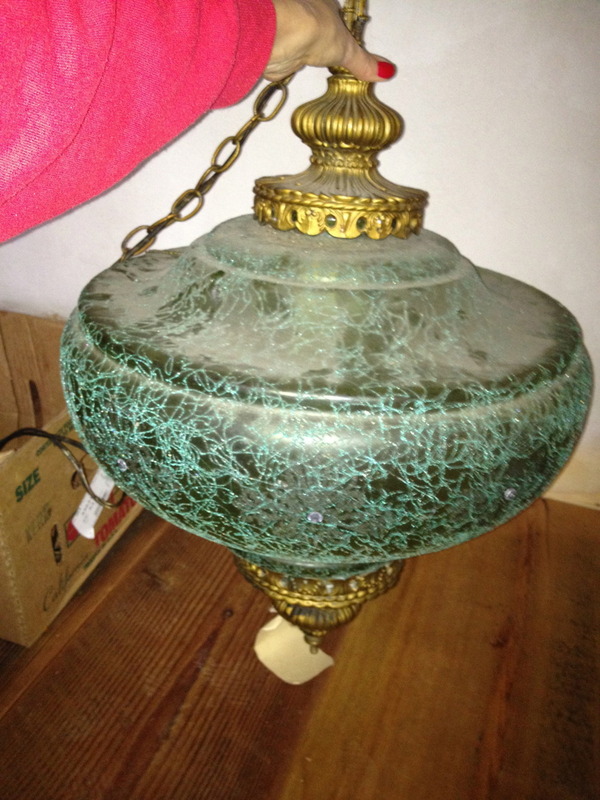 Although it still needs rewiring, I scored this beauty at the Rebuilidng Center in Portland. It is from the pre-1920's and is currently wired for gas (old school). I was told by the guy that helped me get all the necessary parts together for it that to clean the old mounting, I should soak it in CocaCola overnight and all the old paint will disappear. Yikes. Natony is hand applying milk clay to the wall in the entry, while just on the other side of the wall, Kevin is cutting rebar (over my craiglist find fave Viking stove). 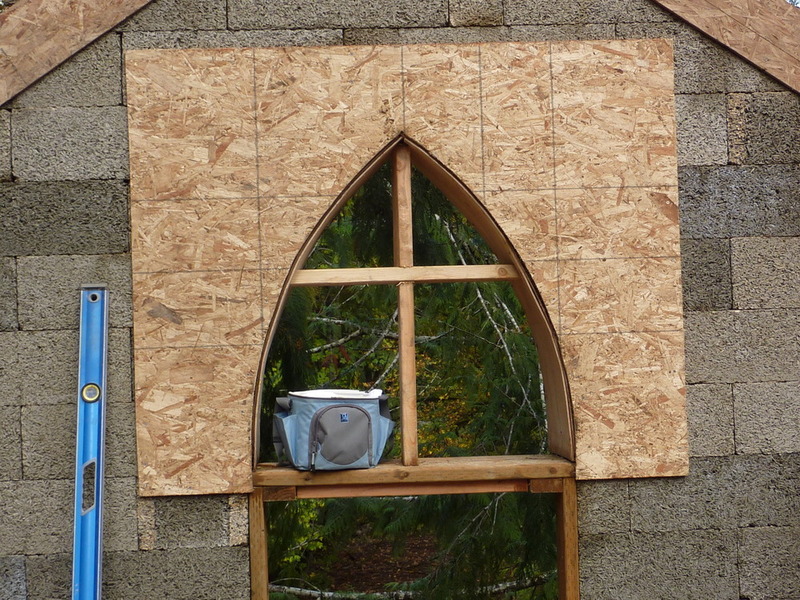 You can see the radiant floor tubing, and the little gothic window space next to the front door. 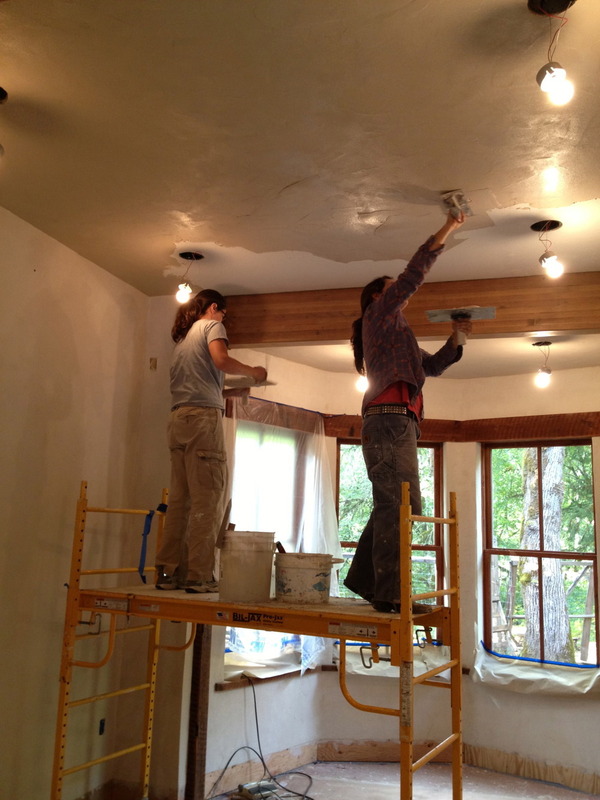 The SO blessed Natonya and June are hand applying milk clay on the ceilings of the living room space. Hard, slow work that results in such an amazingly beautiful finish! Just after the pavement ends, and just before turing into our drive, here is a pic of the rich fall colors and the rain running down my windshield as I park in the middle of the road and take this photo from the driver's seat. 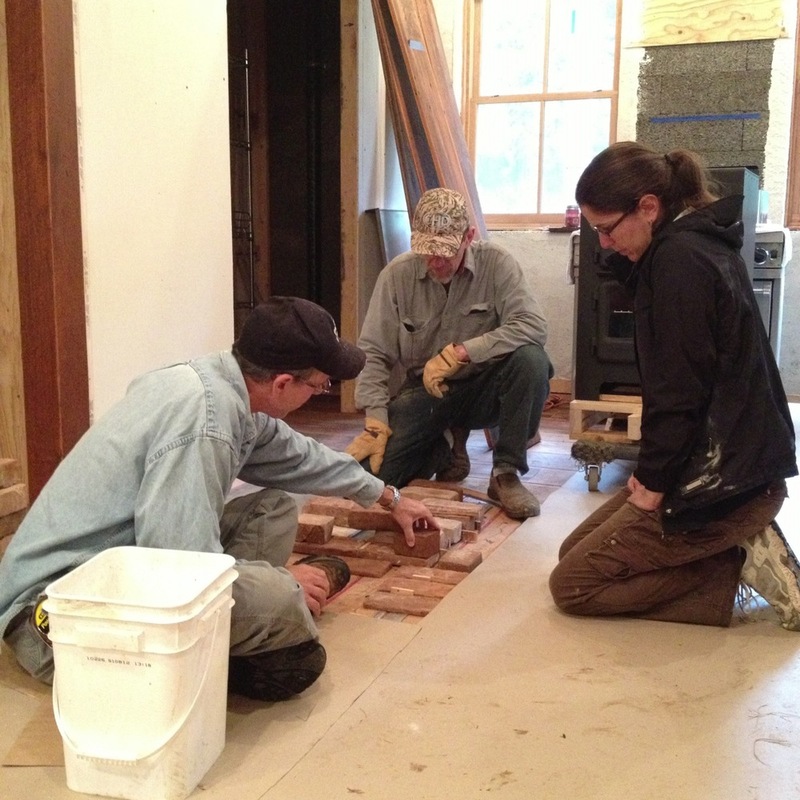 Natonya, Kevin, and Larry work hard to figure out the proper layout for the historic brick hearth (flush with the wood floor is the tricky part). Never could I have imagined what a stellar job our 27 year old neighbor and skilled artisan would do with the laying of our barn wood floors. He is detailed, compassionate, patient and his work warms my heart every time I walk these magical floors! Thank you Charles!!! So, I am in LOVE with what CraigsList is doing for this home. 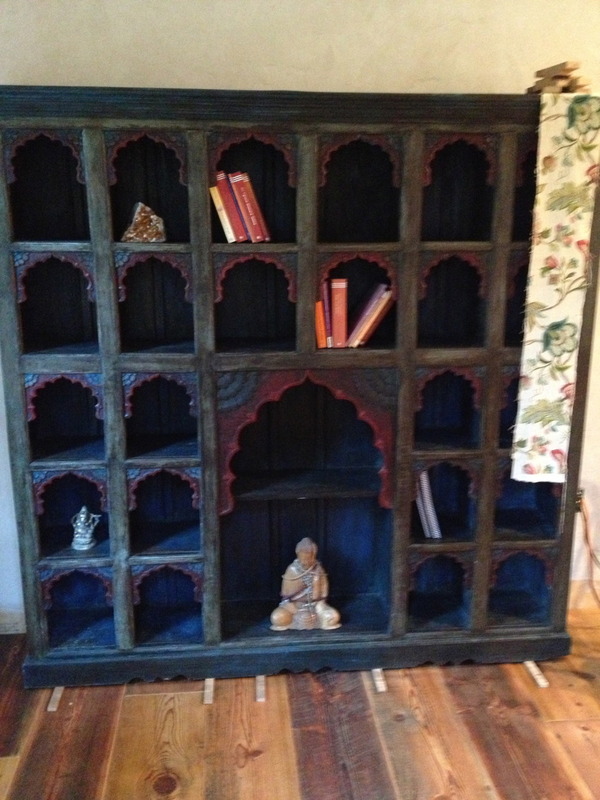 We found this beauty and learned that it was made in India, and was auctioned off, sight unseen, as contents of an abandoned storage unit. We are the lucky new stewards of this, and it graces our Puja (prayer) room on the NE corner of the house. 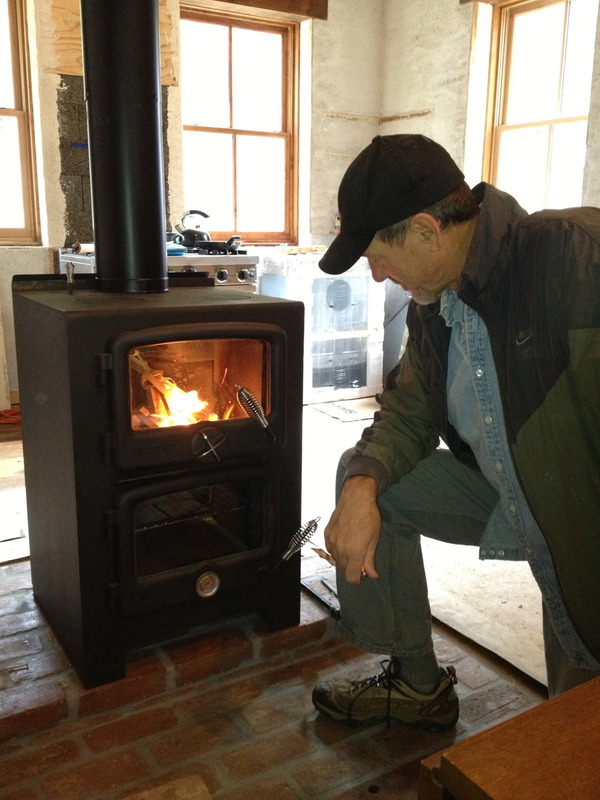 Larry lights the inaugeral fire in the new Nectre bread baking woodstove. The only bummer is that the wood box only takes 12 inch logs and we have to cut our wood into these tiny little pieces. "All the better to load your arms with, my dear!" So, my mom is the list MASTER! And we are doing our best to keep an ongoing list to help us preserve our sanity and patience. Sometimes the list works wonders... other times... not so well! Such is the adventure of building this house! 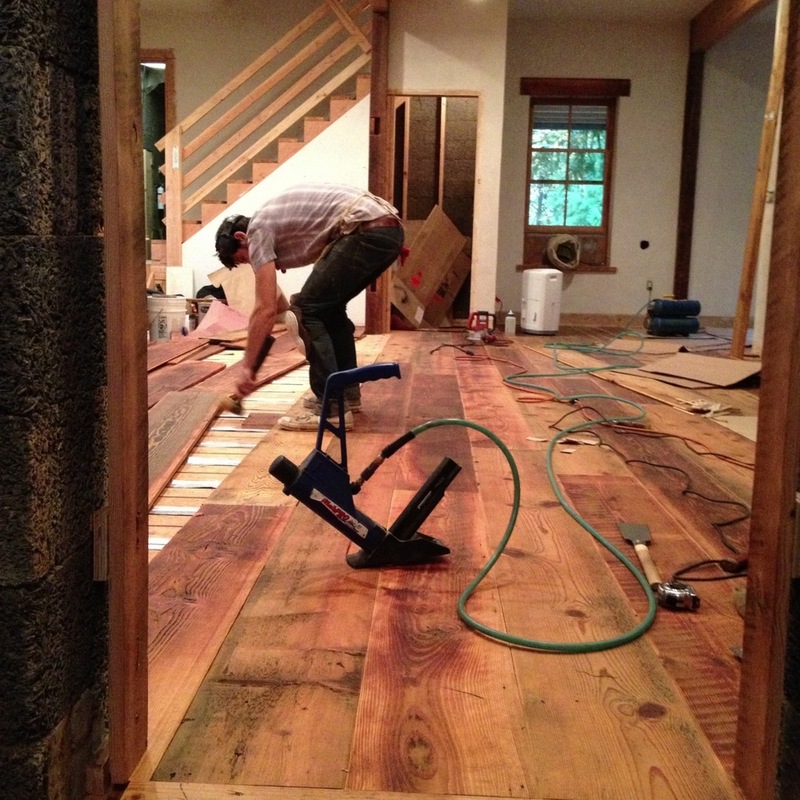 Look at those beautiful barn wood floors -- already laid on the first floor... and the leaning ones are ready for upstairs. Another super cool find on CraigsList, from a cool real estate agent in Portland named Colleen (Moxie Realty). 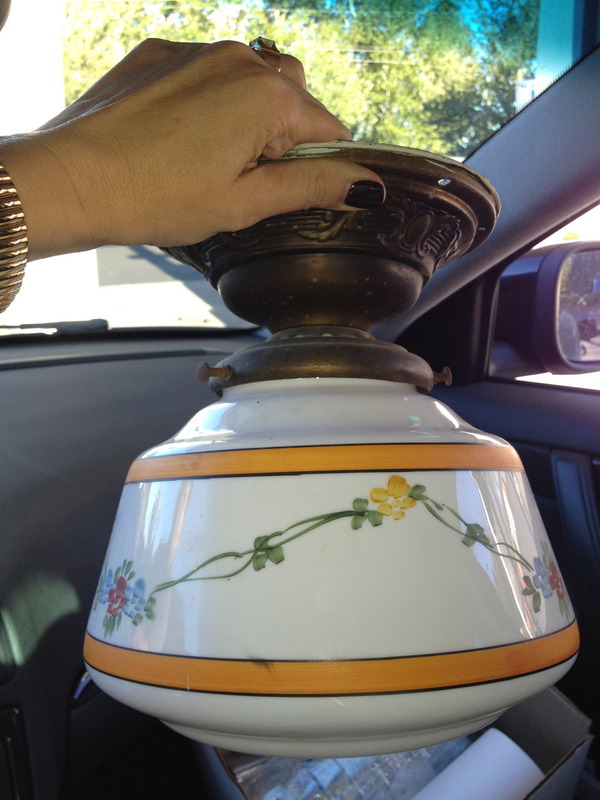 She bought this beauty with her last student loan paycheck just before leaving New Mexico 10-15 years ago. It was hard for her to let it go... but she did (thank you), BUT not without sharing the story about the time a possum decided to live in it for a spell.... WHILE it was in their living room. Nice! 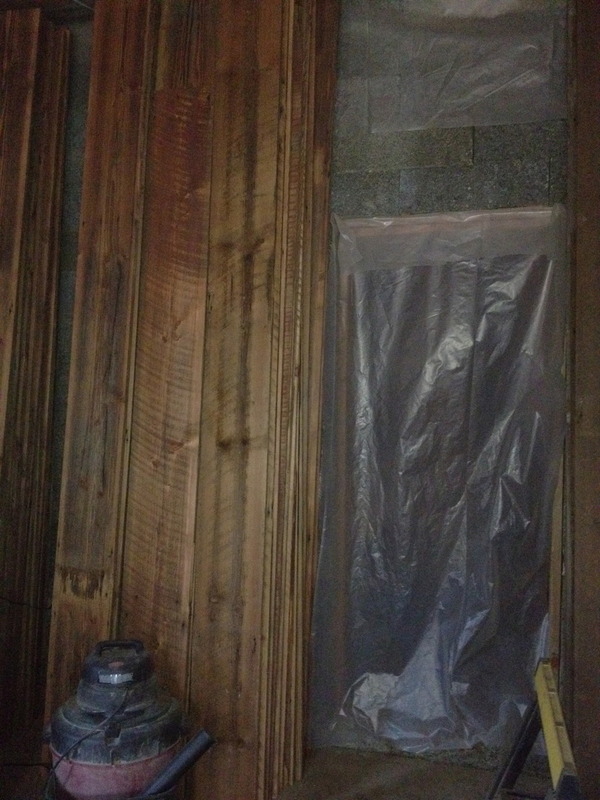 So, here's the main floor from the mudroom door. Jai, our second golden retriever is recovering from salmon poisoning on the floor, cardboard adorns all the floors to keep the workers from having to take their shoes off upon entering, and my sanding/oiling station is off in the distance. 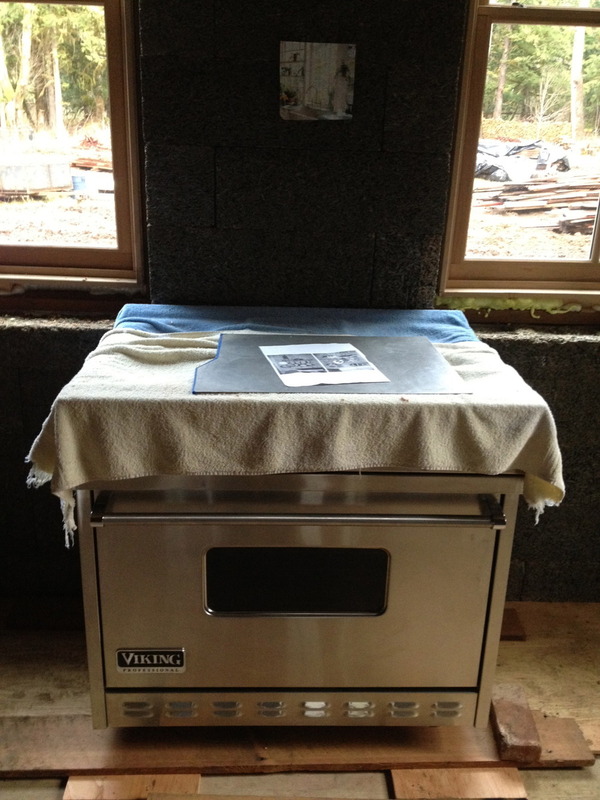 And there's that new woodstove heating up the first floor! 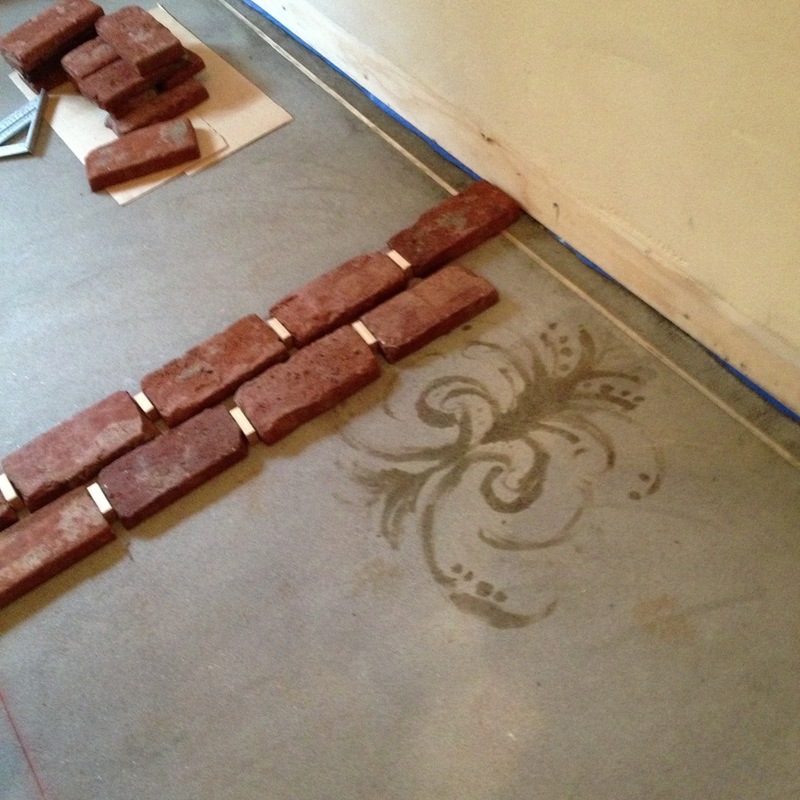 Just before laying the brick in the entry, I practiced a design I really want to do -- or something like it -- on the shower pan in the master bath. This is my first freehand go at it. Not too bad! 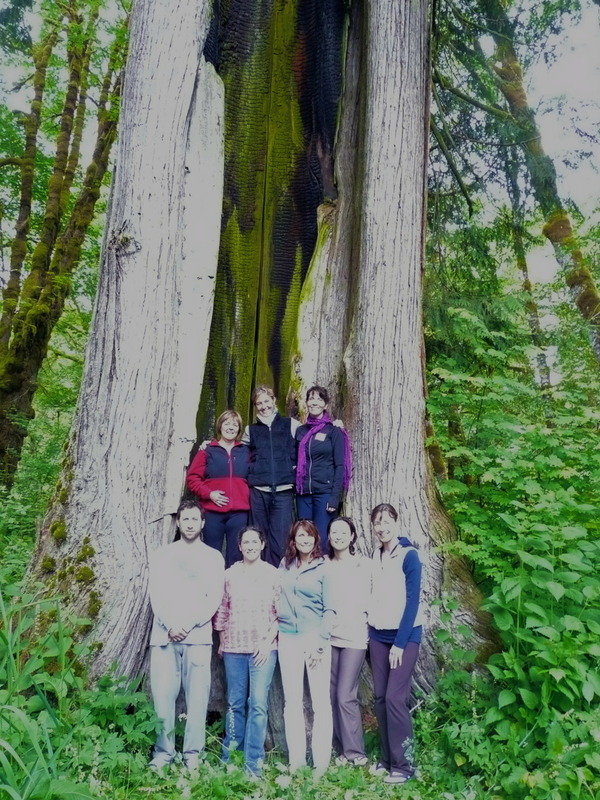 Despite poor quality, you can see the amazing, 300+ year old Cedar Tree that lives on our land. She is marvelous. Just walking... no house yet, just green grass and a will to build. 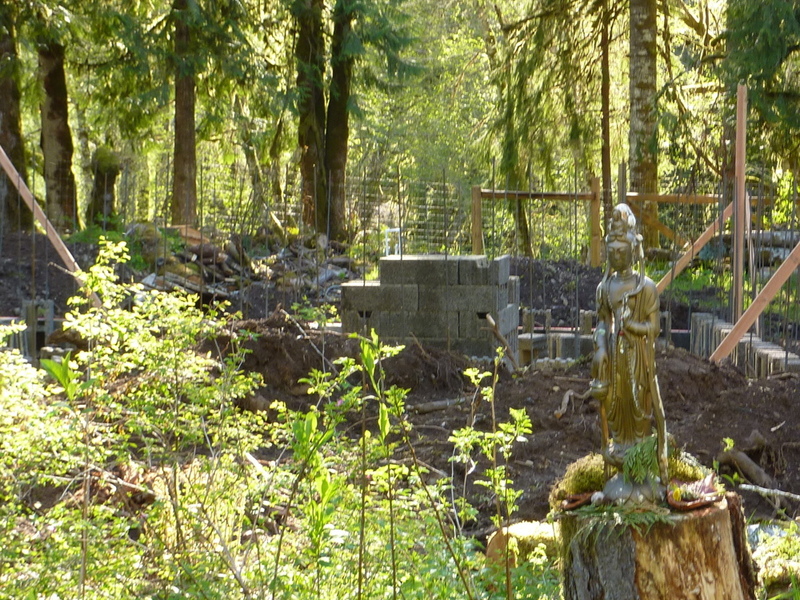 This is the view we will have out our dining room when the house is built. 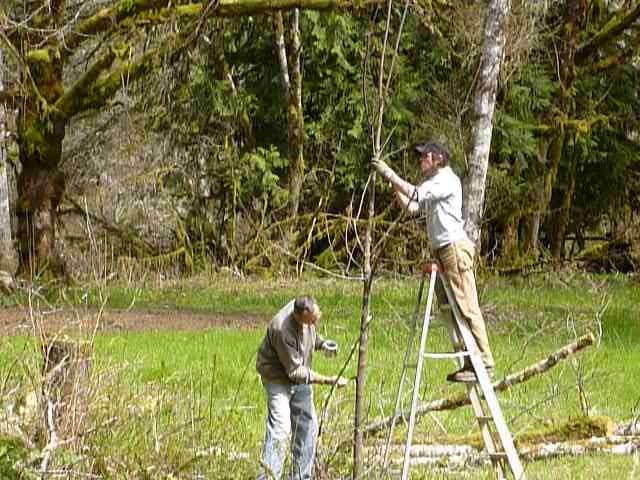 Larry and Hank repairing a beautiful October Glory that not once, but twice, got beneath the arms of a falling tree. 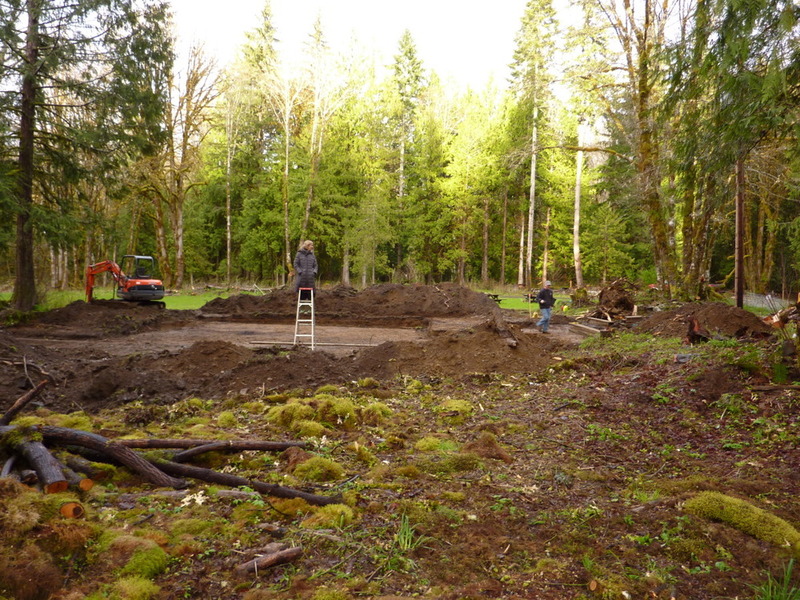 Our amazing neighbor came in to prep the land for the site. We have officially, and literally, "broken ground". This is a view from the house, looking south. Can you see it? Standing at the level we think the kitchen will be... looking out the window, due south. I can TASTE it! 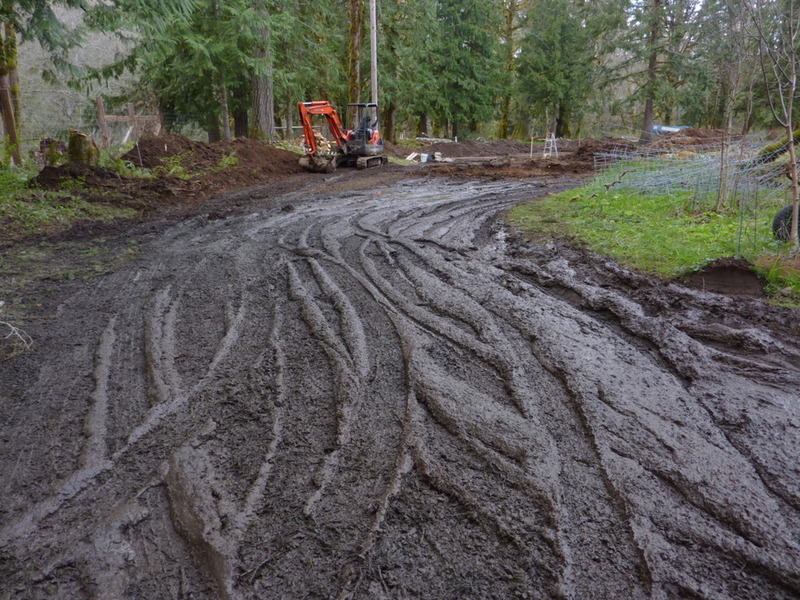 Mud will be throughout the building process... this is how the land grounds us. Set exactly on True N/S/E/W gridlines (versus magnetic), the layout begins. 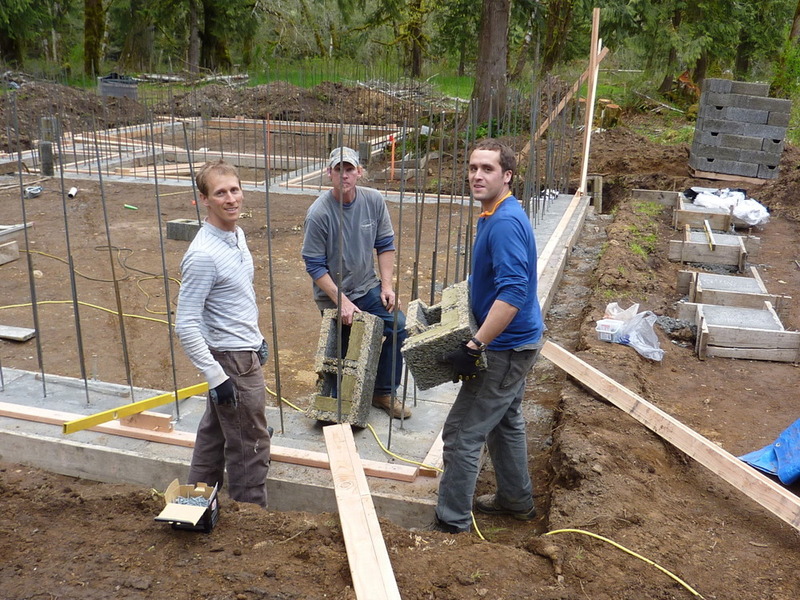 Brian guides us through our first pour with Faswall. Seeing the outline. 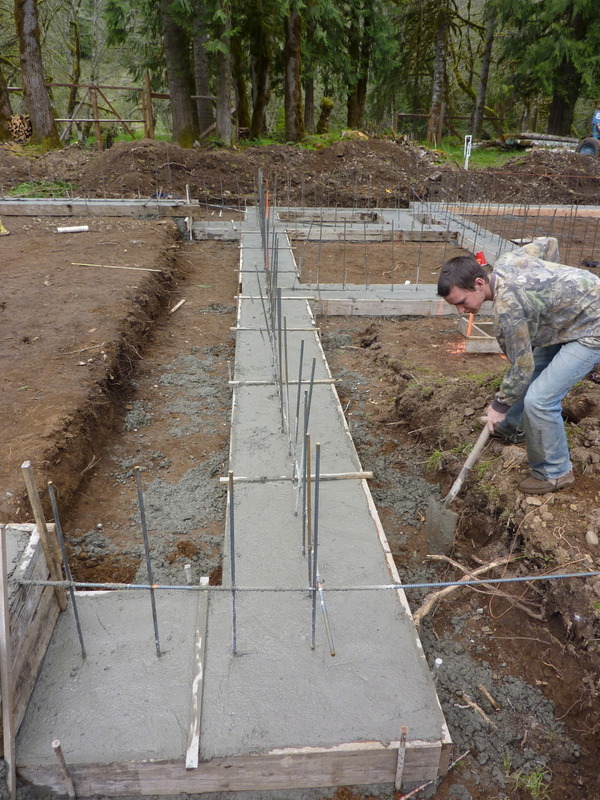 First pour of concrete completed. Let the fun begin. Brian, Loren, and Jared making a plan. 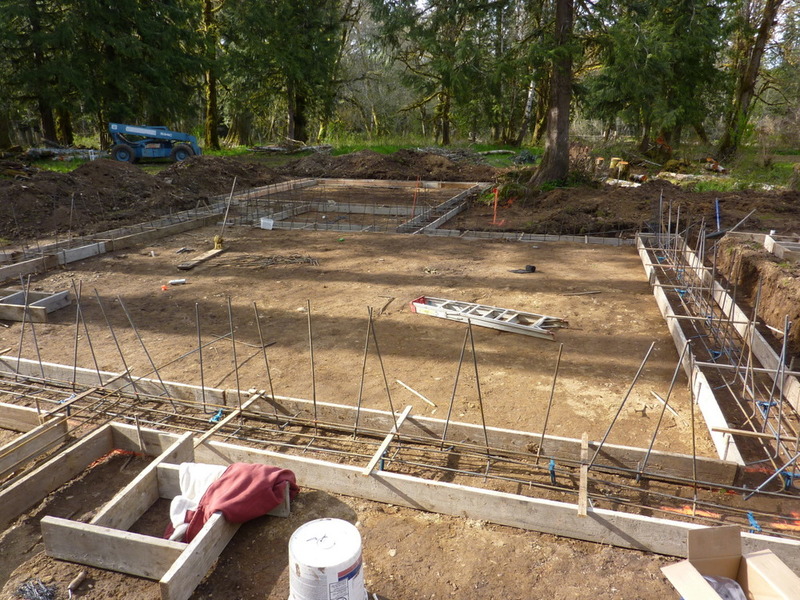 Beginning to set rebar, as the walls go up. Close up shot of the rebar set in concrete in Faswall. Our first delivery of Faswall block. 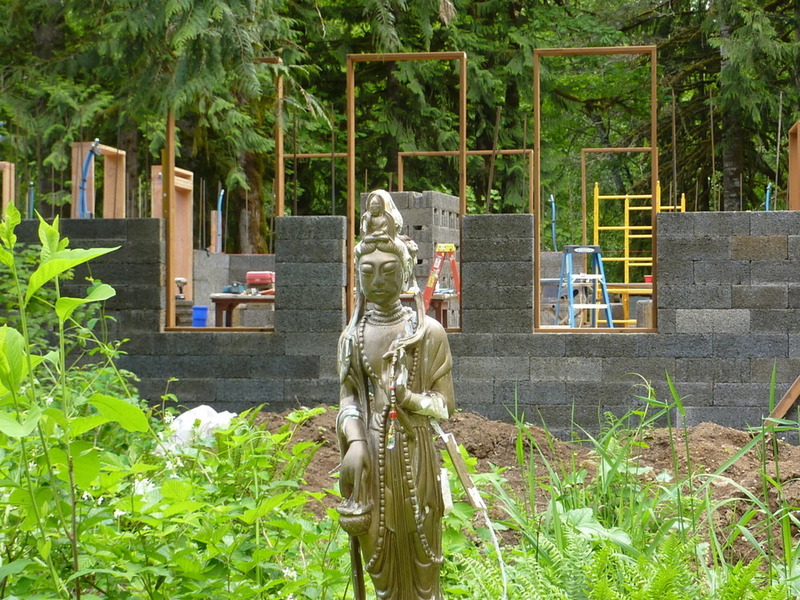 Padma Devi holding space for construction. Larry & the concrete guy. Quite the To Do. And so it shall be for months and months to come. 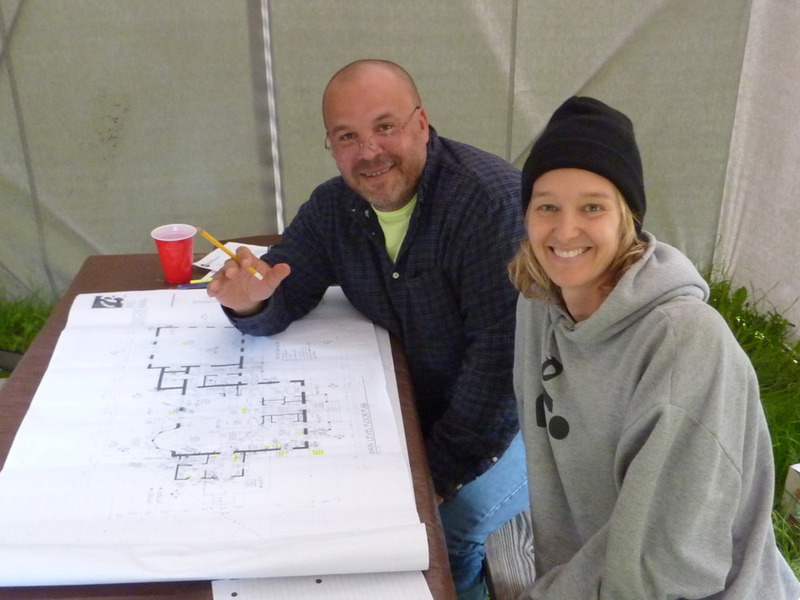 Sitting with Randy in the "tent office", walking through electrical layout. Phone hooked up! Last for digits are 3384 = spells DEVI. Means "goddess" in sanskrit! Here we go!!! The first visual of our bay window off the living room. 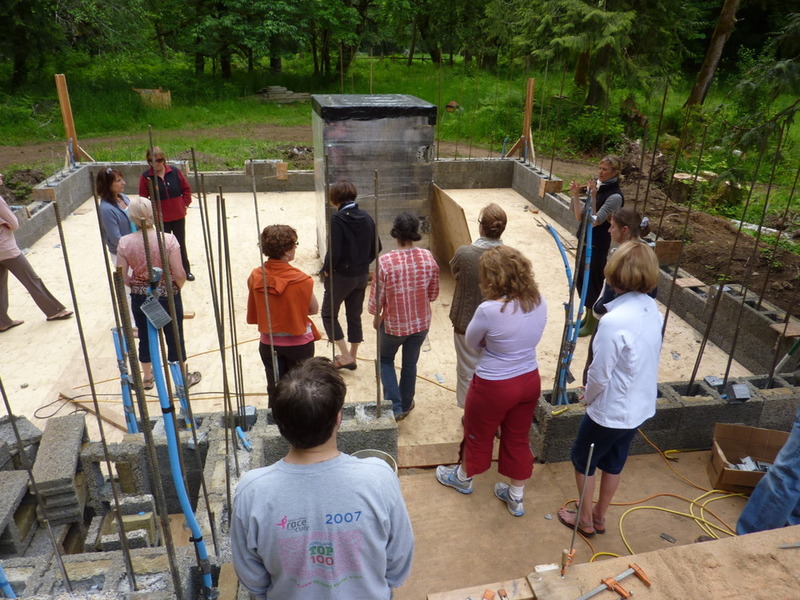 Participants after a retreat with Britt at Cedar Ridge come out to tour the property. Our first tour--how exciting! Carolyn White, our neighbor, gave us her shed, from her old farmstead. Probably 100+ years old. Steve, our maintenance manager, is "carrying" it down the road to our house. Only in rural America. We will call it the "White House" once on site. 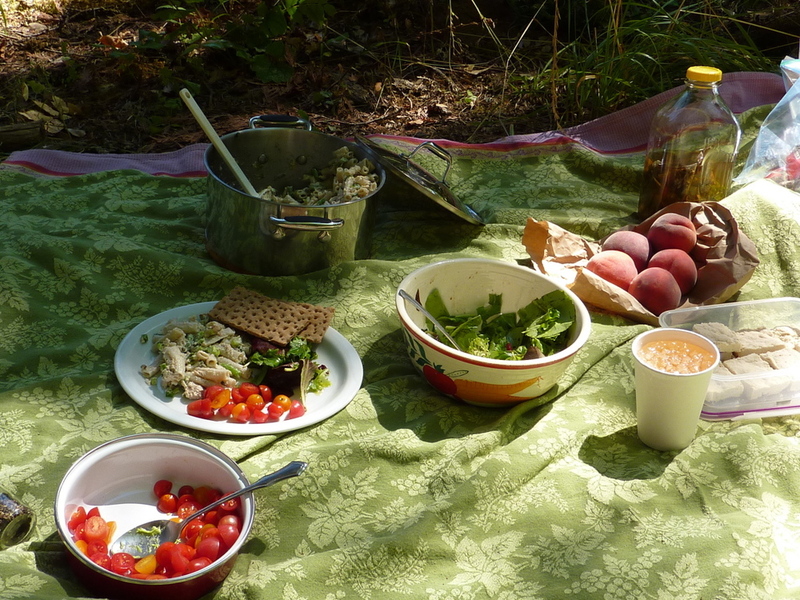 Whenever possible, I would cook meals for the boys. Kept their bellies happy while building. Carol, our kitchen manager, made a lot of sandwiches for these boys too! Thanks Carol!!! The beauty is that right where we shared meals with our construction crew, we will share meals with yogis and yoginis on retreat. Can hardly wait! What a crew. Kudos to them all!!! I always wanted to live in a church. So we have church windows in our attic, inspired by a historic house we saw while driving cross country a couple years back. See how those beauties look from a distance! I like it! This is my second pair of boots. 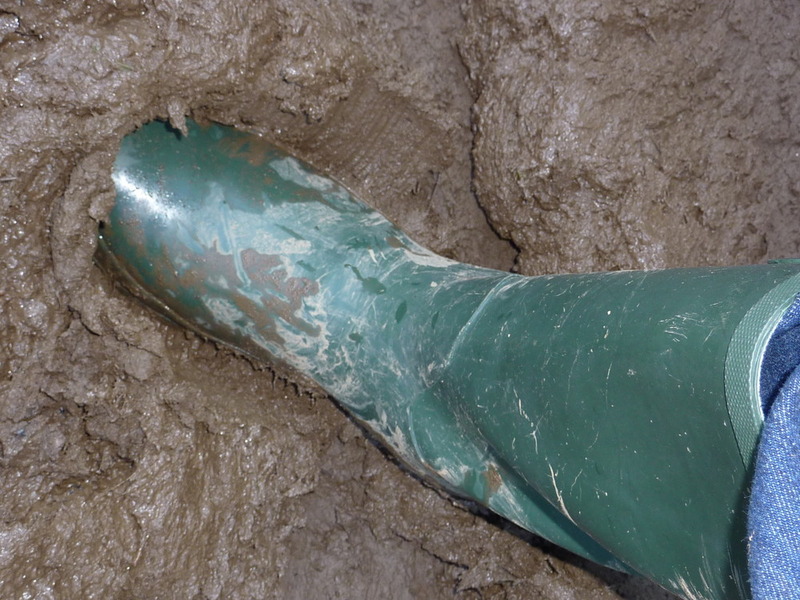 I will be buckling and getting myself a pair of "Mucks" for the occassion of living in the country. Beam me up, Mikey! 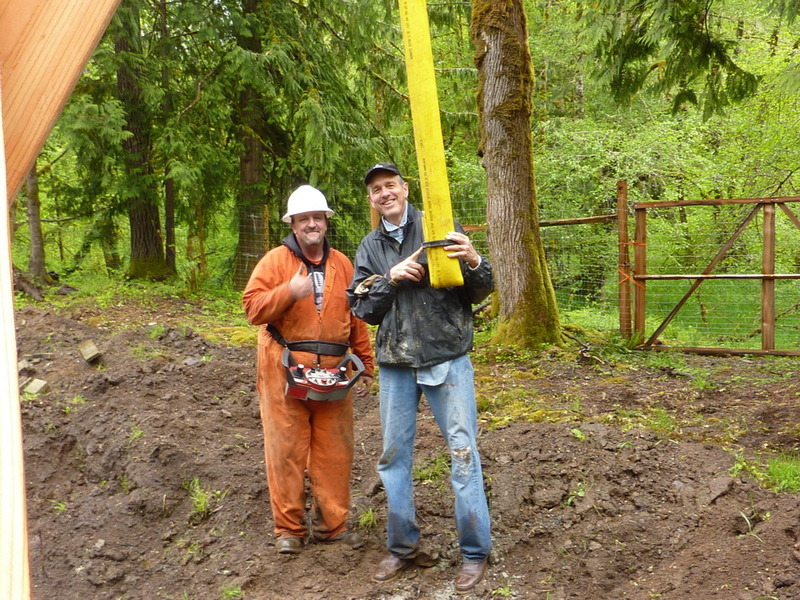 Mike Piehl (the owner of the logging company from reality TV's "Axmen") helps us out with his boom truck to lift our monsterous beams to the third floor. View from the studio end of the house--the felt is on the roof, and we are dried in, despite the mud and rain. The felted roof view from the south end, where the mudroom lives. Love it when friends come! Thanks Ang!!! Looking down. 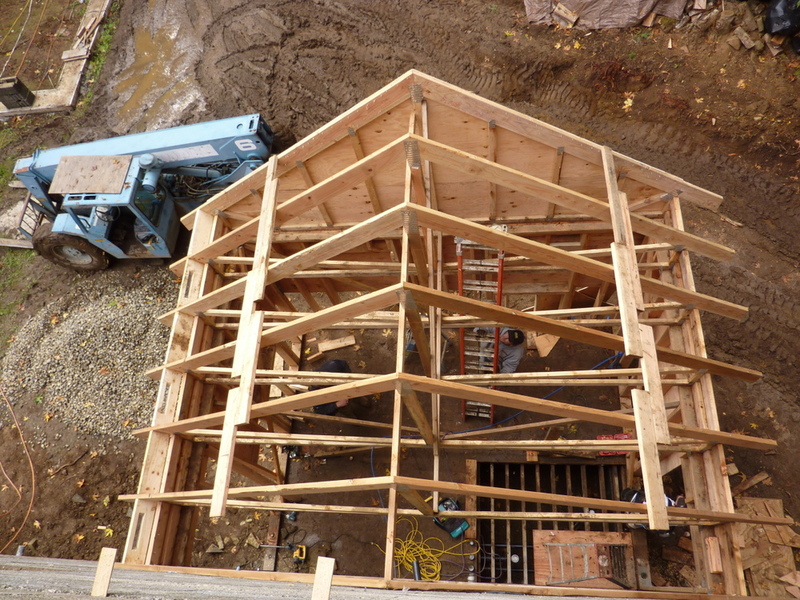 Larry took this from the tippy top of the main roof of the house looking toward the new trusses in the Yoga Studio. 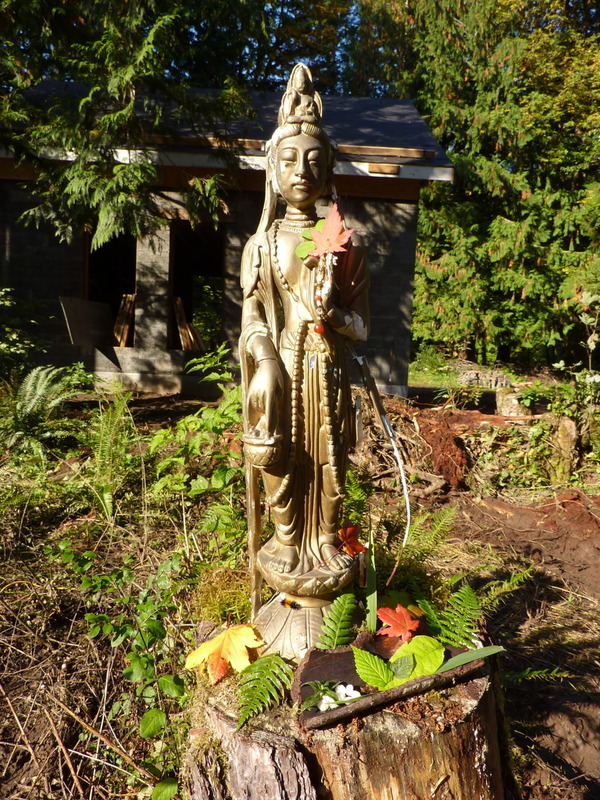 Watching the seasons change with Padma Devi. She just hangs out and holds space. Love that about her. 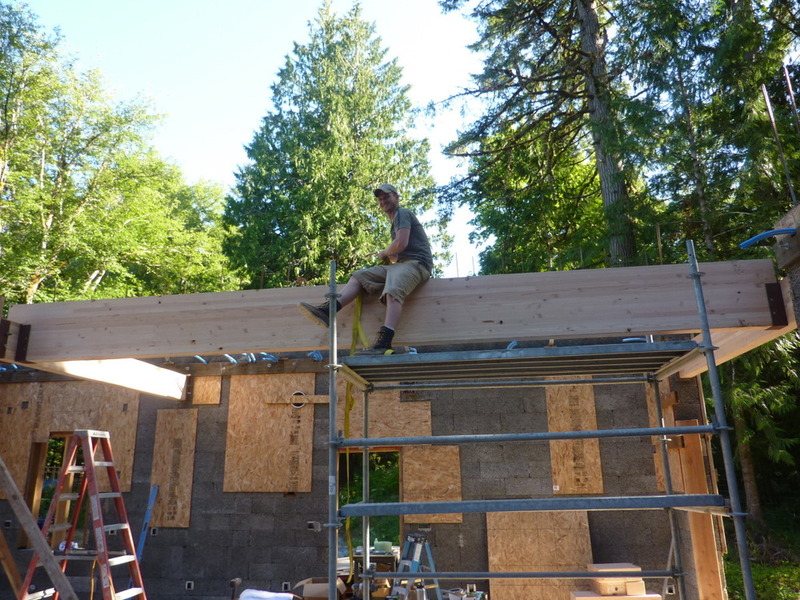 Or should I say, "ON" the attic... roof yet to come. 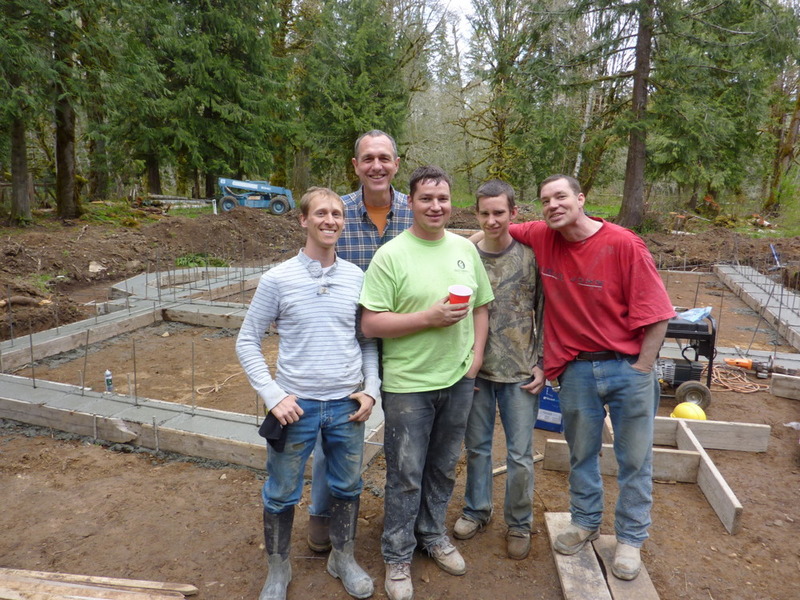 Our final concrete pour. I believe we had six in total. 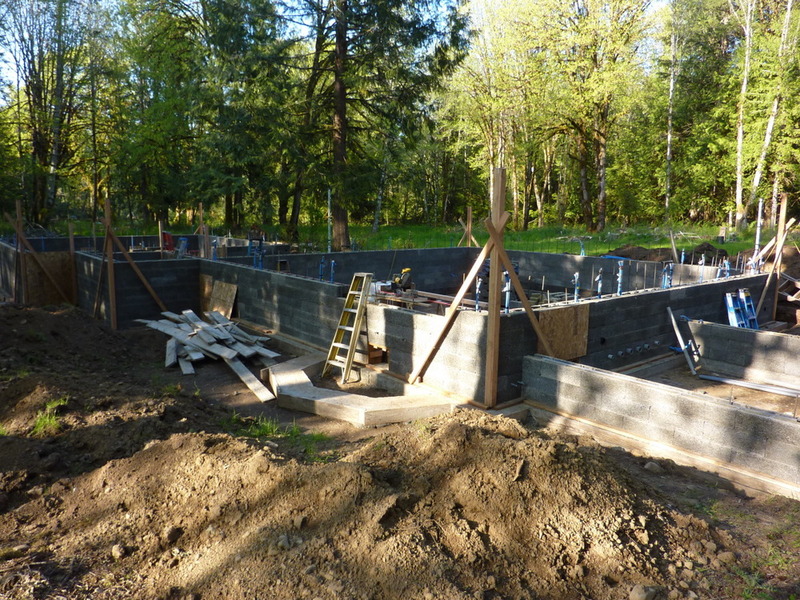 Walls are now full to the brim with concrete! Reminds me of that old black and white... circa 1932. Lunch atop a skyscraper. Hanging out at the job site... this dog has the digestive power of the SUN alright! Rubber glove. Salmon bones. bread twisty. Rocks (4). Rubberband. Candy wrapper. Bright purple foam earplub. Someone save him from himself, please! 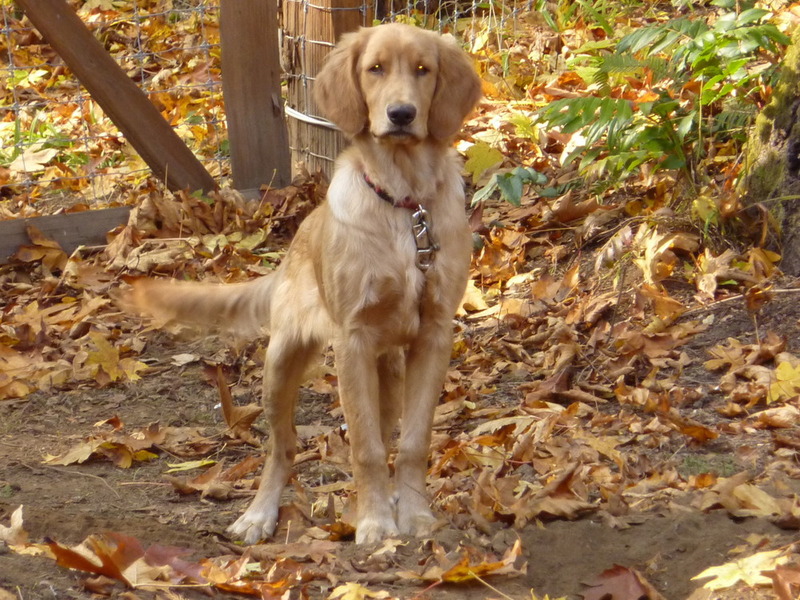 He's only 10 months old (seven in this pic). Shannon shows us the richness and width of our barn wood floors... taken from the largest dairy barn in Washington County when it was deconstructed. The seasons come and go... she stands and waits for us to arrive. Being a Minnesota girl, this snow shot is so exciting! I can envision the beauty of this place in the winter time. Cozy meals, heated floors in the yoga studio, and the snow falling, silently outside. 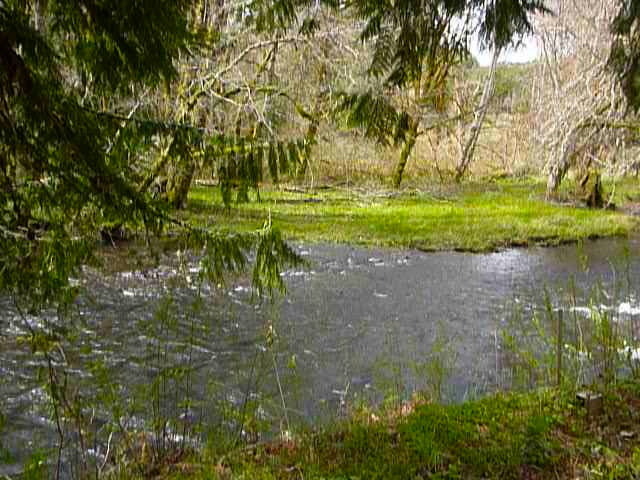 We are surrounded by Creeks at the YogaFarm, and this one runs under the bridge we'all must cross on the driveway. 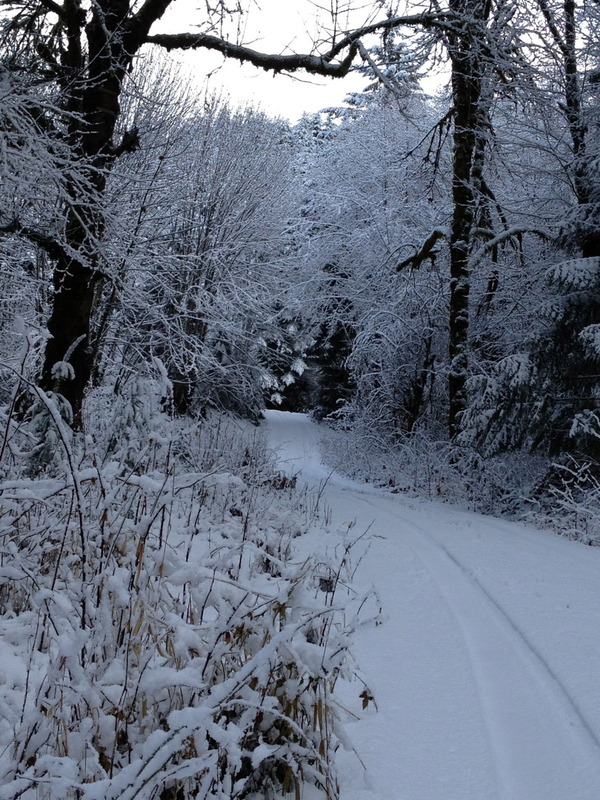 I stand on the bridge, over Fall Creek, looking out the drive toward the gravel road... what you see when leaving in the snow. Each step feels like a milestone! When we drove up at dusk and Randy had the electricity set up, it was so exciting! 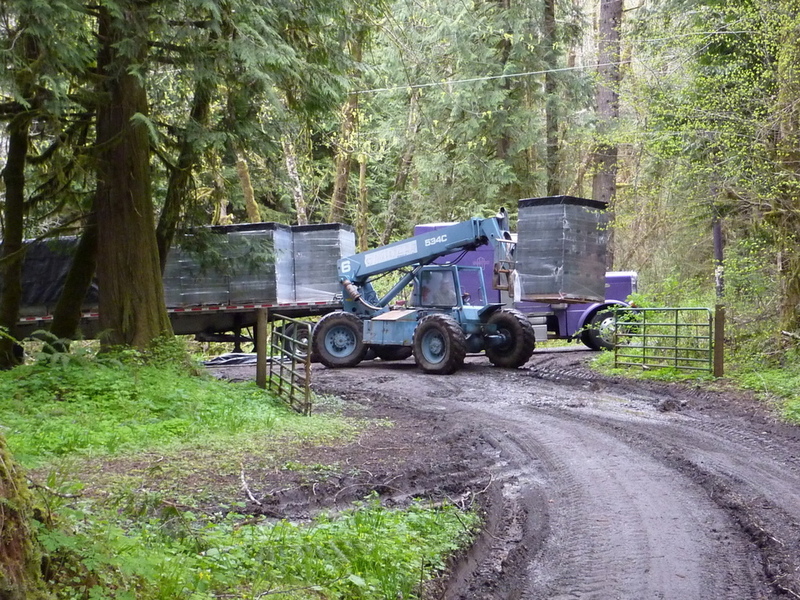 We had to move the Chimney, because the house wanted the wood stove somewhere else. This is it's final home. 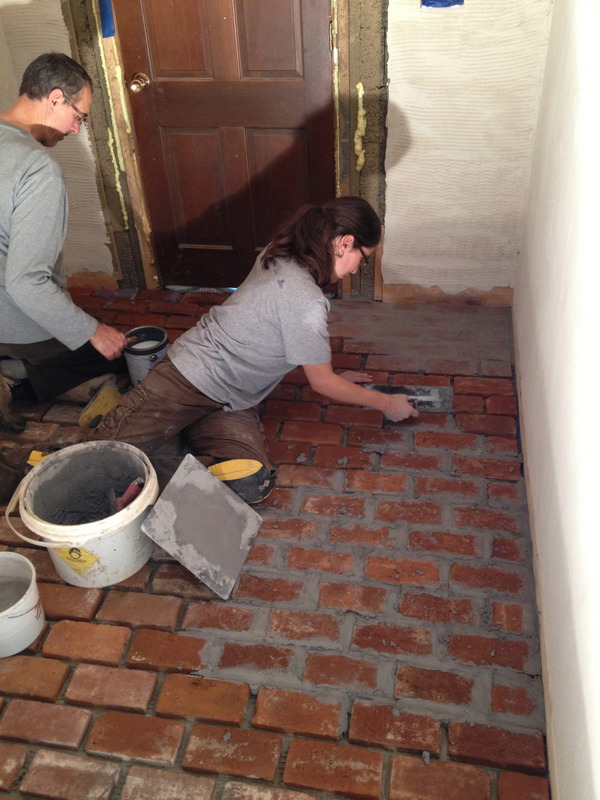 These bricks are from Salem, circa 1917, and will wrap our chimney and dorn the floor of the entryway to the house. The final windows are in. I love the gothic shape. This is our mechanical shed / slash / pump house / slash / RED SHED. We will call it the "red shed" because it will be the one building with the red side of the historic barnwood siding we have. Buying old doors to be redone for our two sets of french doors in the house: one in the dining area, the other set in the yoga studio. 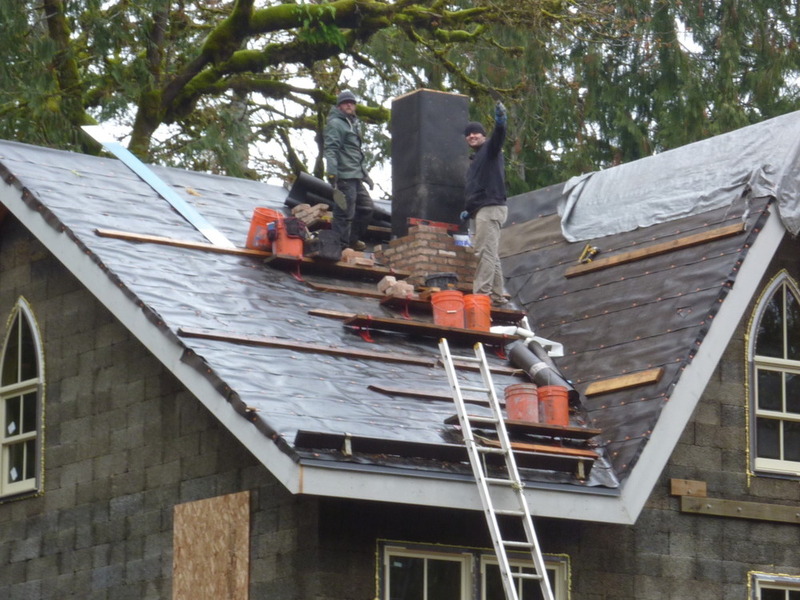 The chimney bricks are going on, in true, historic masonry fashion. 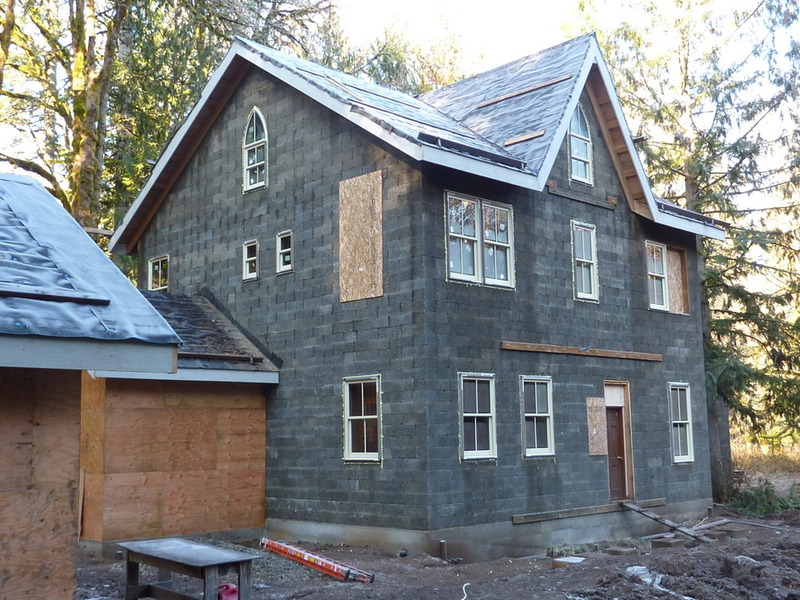 We thought they would be cut for a "facade", but our mason, Mark, built this as old chimneys would be built. Jarrid reinforced the chimney on the inside as a result! 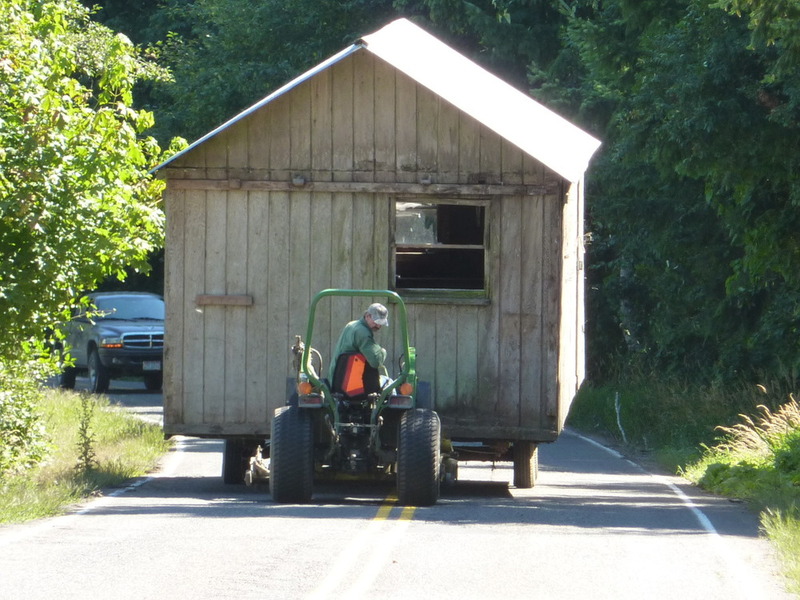 Without an outbuilding, the inside of the house is a moving storage / slash / work space. Exciting to see the stairs go up! Great work, Jarrid! The Yoga studio serves as the "shop" to complete the house. Note the size of the windows (Shannon is about 5'8")... Those windows send you up up and away during your practice! Like practicing on the soft cedar fronds themselves. Planning the Barn. 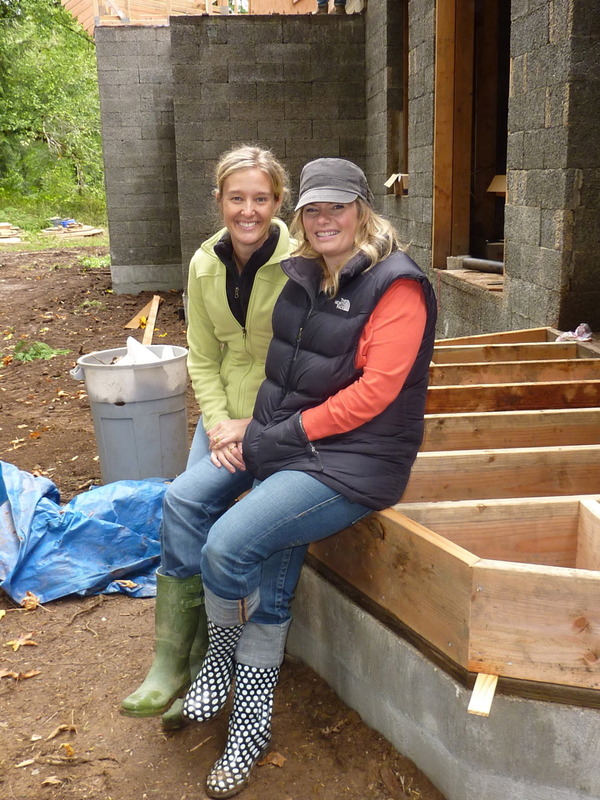 Who can have a farm without a barn? Barnsite cleared. 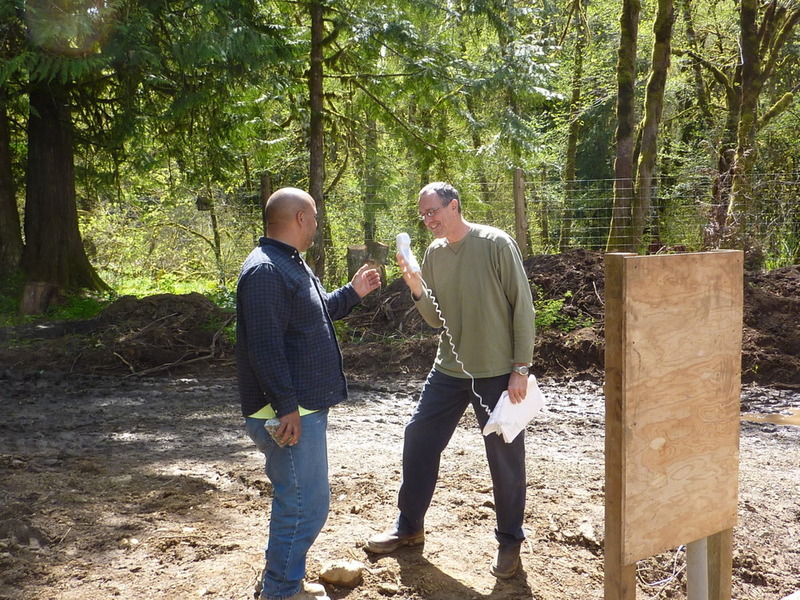 Plans chosen (thanks to the Ely family here in Vernonia who sport a beautiful rebuilt barn that Larry LOVES). Indio, and the "kids" (goat babes, that is), will be soooo happy here. 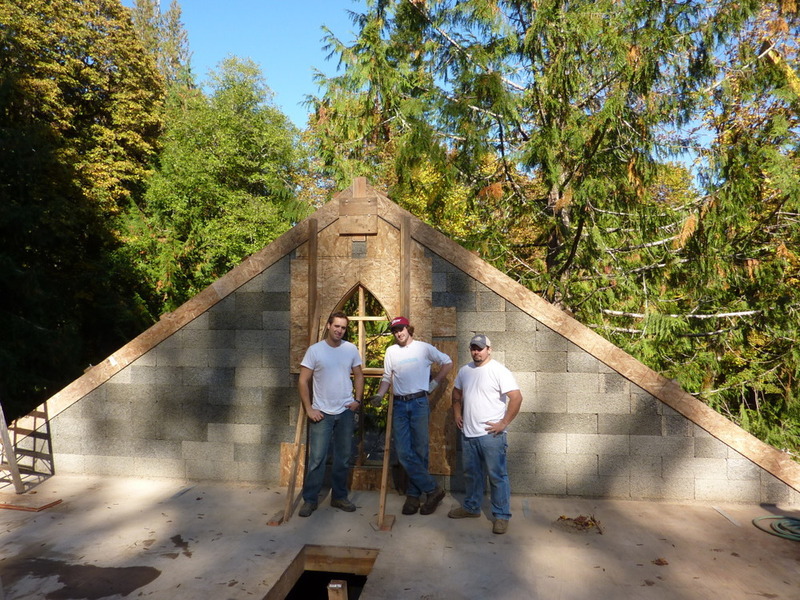 Just as you pull in the drive, roof complete, windows in. Electricity and plumbing rough in completed. We are getting ready to move inside. (The exterior will be an earthen plaster color--mustard to terracata color... but can't go on until the weather warms up -- May or June). 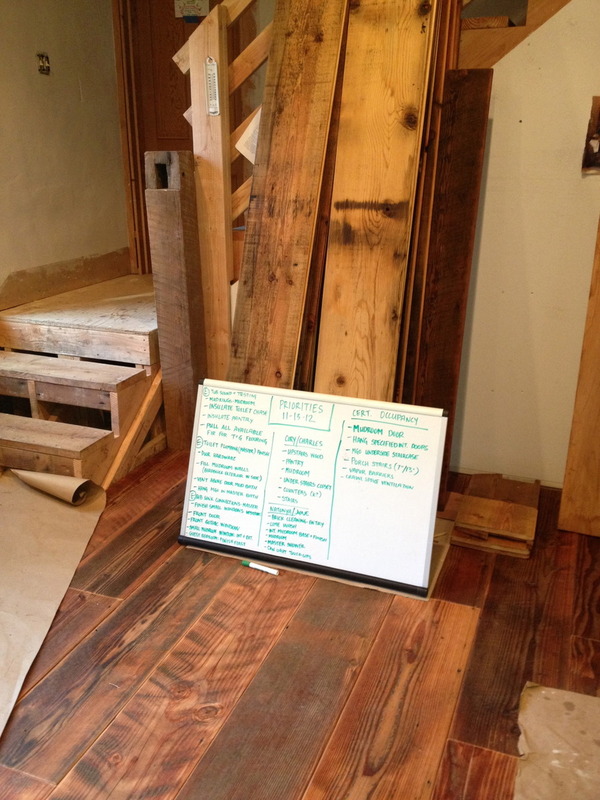 Shannon has planed enough wood for all of our floors! Looks awesome!!!!! Looking up to the Library of the house. I am sooo excited! 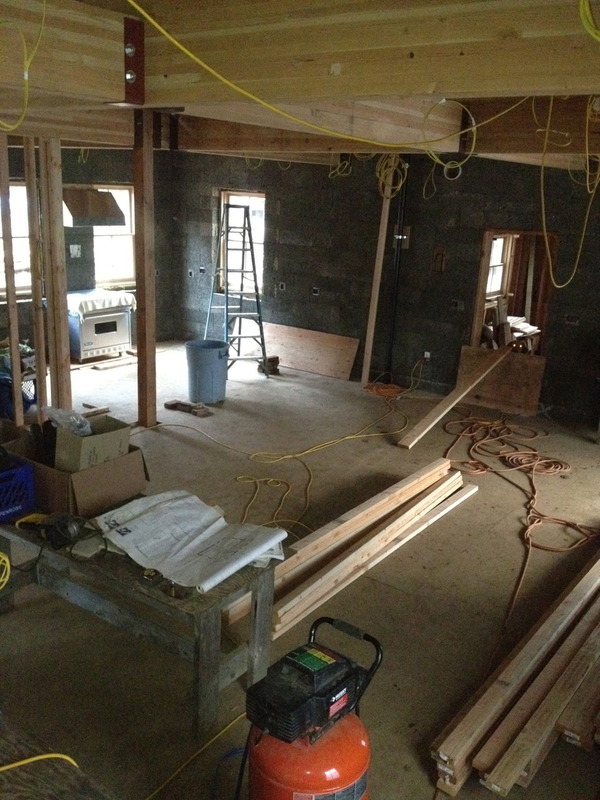 This, my Dears, is the ENTIRE first floor of the main house... see the kitchen off in the distance. All open and part and parcel of nature... when you stand in the very center of the main floor, second floor, and attic, and look true east, west, north, or south you will see nature. Windows draw us out. Craigslist and a lovely couple from Southern Oregon, and we have ourselves a brand spankin' new (to us) used Viking 36" gas range with grill and hood. Gorgeous! Here's one of our inspectors. They have been great in supporting us with a building material that is unusual and new to many of them. Thank you for your open minds! 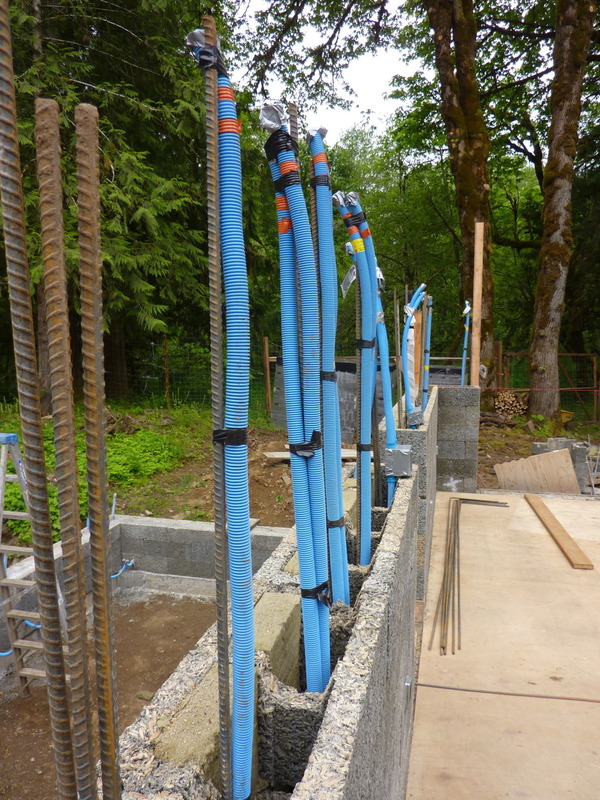 Randy, our electrician is teaching me a whole new language: this is "smurf tubing" which is strung through the walls, and concrete is poured around it so electrical can be run. 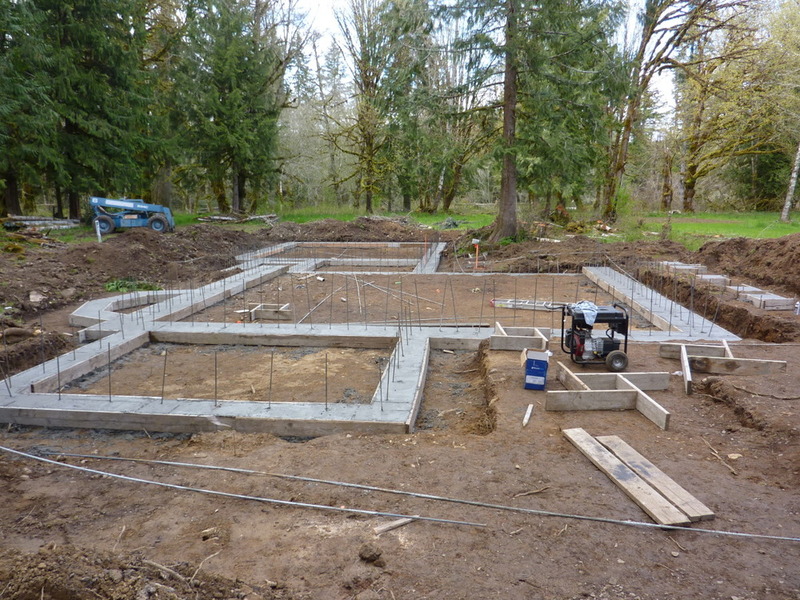 Good news/bad news: we had to decided where and what was to be run before the walls were poured. At least it is done! The beams in the house are incredible. This is the one of the main ones. They are beautiful and very substantial. Keepin' these busy boys fed is a full time job! 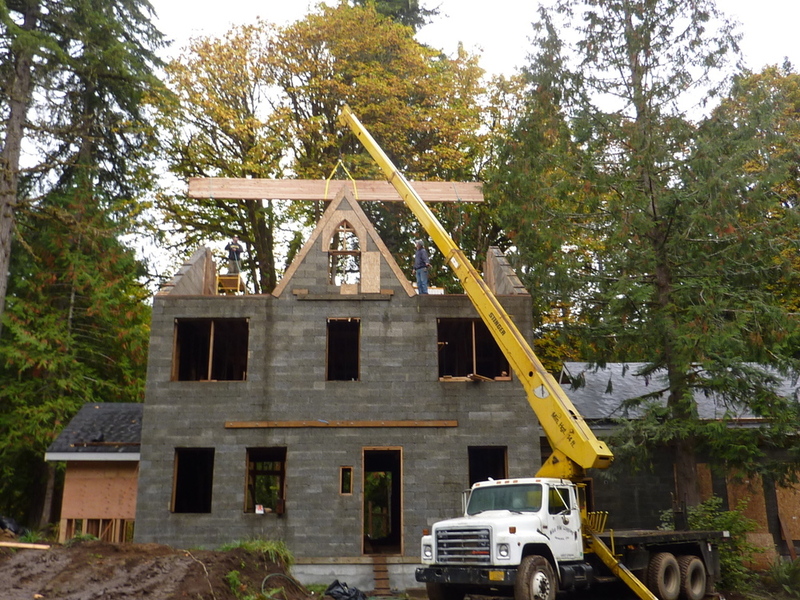 Compliments of Andy, our architect, extraordinairre, this is how we visioned the house before it began rising. Amazing to watch it come from the ethers to the form that stands before us today.